It’s almost Sakura Medal season at school! Students start reading and voting in October, but before that, my book bowl team members get an exclusive sneak peek to start reading for the competition. We had our first meeting on Friday, and I think we got a good group together. This year, it’s my goal to read all of the English-language books for elementary: twenty picture books, twenty chapter books, and twelve graphic novels. The Book With No Pictures, B.J. Novak Exactly what it says on the tin: This is a book with no pictures. It starts out looking boring and serious, and then goes over the top with weird noises and funny words and ridiculous sentences. I heard so much about this book that I was excited to order it. #unpopularopinion: I did not enjoy this book at all. My students enjoyed it. They thought it was great. Classes begged me to “trick” their teachers, to go tell them that this was a Very Serious And Important Book About Reading. Talking about the book was fun. Reading the book? was not fun. Maybe because I don’t do ~voices. A better reader might enjoy it more, but I didn’t even like it when I read it in my head. I gave it two stars, but assumed I’d bump it up after reading it aloud. I actually dropped it down to one star. I love meta books like that, but I’ve read better. 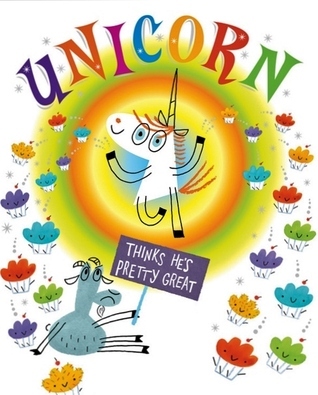 Unicorn Thinks He’s Pretty Great, Bob Shea Goat’s life was just fine until annoyingly perfect unicorn showed up and ruined everything. But as Goat gets to know cupcake raining unicorn, he learns that nobody’s perfect. That’s how I felt about this book. It was okay. I think my students will like it, but I was neither impressed nor underwhelmed. In fact, it took me awhile to remember, What was the fifth book I read?. The art is okay. The text is okay. The moral is actually pretty interesting, but okay. One thing that annoyed me: Unicorn is jealous of Goat’s cloven hooves, but traditionally, unicorns are depicted with cloven hooves, and sometimes even with a goat’s beard. I thought that was a missed opportunity, because 1) it’s wrong, and 2) you could have really played up the commonalities between Unicorn and Goat to greater effect for the moral. Miracle Mud: Lena Blackburne and the Secret Mud that Changed Baseball, David A. Kelly When baseballs are brand new, I guess, they’re too shiny for the batters to see properly. So back in the day, they used to soak them (too soggy) or spit chewing tobacco on them (too stinky) to wear down the shine. Lena Blackburne, wannabe baseball player extraordinaire, discovered some special mud back home that’s still used to this day. I didn’t know anything about this special mud. This was something completely out of my field (ahem) and I liked it! I learned something new, and the prose and illustrations were nice. I don’t mean to damn it with faint praise. I mean, they were nice; nothing stand-out, but not distracting, either. 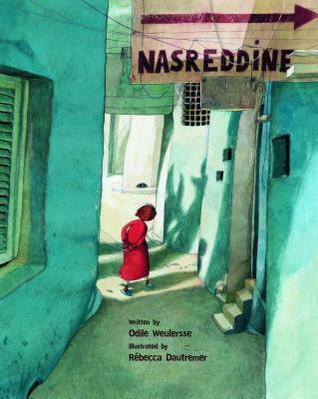 Nesraddine, Odile Weulersse A little boy overhears people criticizing his father for riding to town while he walks, and tries to find a solution that will please everybody. First, he rides and his father walks, but people shake their heads about kids these days. Then neither of them walk, or both of them. Spoiler alert: You can’t please everybody. Nesraddine is so gentle. It’s a fable, but it’s not anvilicious. Nesraddine learns an important lesson, but his father’s teaching is kind and he allows Nesraddine to experiment and learn for himself – until he suggests carrying the donkey to town! The art was warm and sweet. Even the criticizing characters are given their humanity by the painted illustrations, and Nesraddine and his father are lovingly drawn. Weasles, Elys Dolan When the weasels try to take over the world, nothing goes as planned. A variety of colorful characters scurry through the story, alternately helping and getting underfoot while everyone tries to fix The Machine. This could probably be a good book to read before starting a group project, examining how each weasel helps (or hinders) progress. I just love this book so much. I finished it and immediately read it again so I could take my time to linger on the pictures, the flow of words. I was so excited to finally get a chance to read this. I was not disappointed. I’ve mentioned before that Holly Black’s Tithe was life changing for me as a sixteen-year-old. It introduced me to urban fantasy, and I spent the next several years reading everything I could find. All because this one book turned me onto this genre and I couldn’t get enough. The Darkest Part of the Forest is Tithe, if Holly Black wrote Tithe ten more years into her writing career. I’m not saying she’s recycling ideas or characters, and this isn’t a reboot of the Modern Tales of Faerie series. It’s a return to themes and concepts of those books, by a more mature writer: conflicted family relationships, trying to protect the ones you love by lying to them, a childhood (mis)spent with faeries, a town on the edge between reality and fairy land. There’s even a faerie revel like in Tithe, but instead of just being about Kaye and Kaye’s problems, Hazel has to worry about her whole town – and that was better handled than when the courtless fairies run amok over Kaye’s town in Tithe. The diversity felt more authentic and less weirdly Mary Sue-ish, and the realities of growing up with irresponsible bohemian artist parents were more realistically addressed. I’m not putting down Tithe at all here. I loved Tithe. I just think The Darkest Part of the Forest is better, at least, technically. The Darkest Part of the Forest is a the better book, but I think Tithe is more fun. Maybe just because Roiben is so dreamy. Swoon. My only other criticism? Why, at least in the books by Holly Black that I’ve read, which is not all of them, is the main character a straight girl and the secondary character a gay boy? Although, once again, even that was better handled than Tithe‘s Kaye and Corny; Ben was much more fleshed out and interesting as a person. 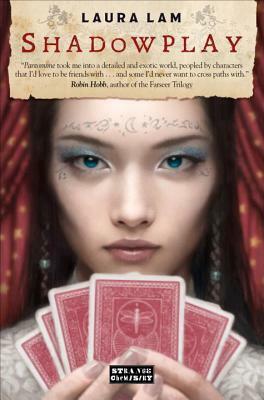 This is a good book, and you should read it – especially if you liked Tithe in particular or urban fantasy in general. 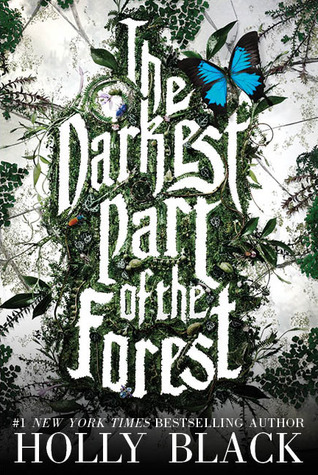 The Darkest Part of the Forest weaves together a contemporary, character-driven novel with an urban fantasy adventure story, and it was very well done. I really liked the shout out/potential future tie-in to Tithe, and Roiben’s old queen and the new king on the East Coast. Doujinshi, otherwise known as independent manga in Japan, is rarely published in English. In fact, it’s considered underground and quite exclusive in its home country of Japan as well. 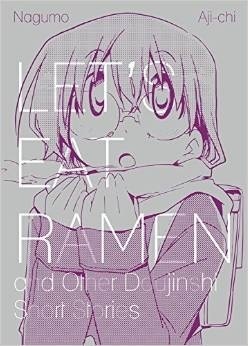 Let’s Eat Ramen and Other Doujinshi Short Stories finally gives western readers an exclusive look at the elusive world of contemporary Japanese doujinshi manga. Let’s East Ramen is a three-part tale of Saeki, a girl who loves ramen noodles. At last, she thinks that she has finally found the perfect ramen shop, but the problem is the shop is completely full of old regulars and she can’t get in. Will the timid Saeki ever summon the willpower to reach out and get the ramen that she desperately wants? The summary on Goodreads only covers the first story, which lends the collection its title. After Saeki’s story, there’s “Plastic Blue,” the story of an ill-timed, unrequited first love, that works out in the end for the two girls; Urameshiya, a ghost story with a twist that, again, works out well for the two girls in the end; and You Make Me Dizzy, a schoolgirl maybe romance that works out pretty well for the two girls in the end. The sweetness (savoryness?) of “Let’s Eat Ramen” was followed by the melancholy of “Plastic Blue.” Minato confesses (i.e., her crush) to Shizuku, but Shizuku shoots her down, saying, “I like you as a friend.” We can only assume it’s internalized homophobia or a fear of coming out that makes Shizuku turn down her friend’s confession, because a year later, Shizuku is still kicking herself. In the end, Minato dumps her boyfriend and the two girls get together and the story ends with Shizuku and Minato flirting, smiling, and holding hands, which is pretty much exactly how I like my girl/girl stories to end. “Urameshiya” is a sweet little ghost story with a twist. (A footnote on the page explains that “urameshiya,” which the girls use to greet each other as an inside joke, means “boo,” like a ghost.) I don’t want to give it away too much. Suffice to say, it’s a cute story of a girl who likes to garden and a cooler member of the swim team and how they become friends while Hanako tends to the garden (her name means “flower child;” it’s also the name of a ghostly girl in a Japanese urban legend who usually haunts girls’ school bathrooms) and Natsume (“summer”) attends swimming practice – although she seems to spend more time chatting with Hanako than practicing. The last story (and my least favorite) was “You Make Me Dizzy.” Although this one wasn’t as cute as the others, I liked that the girls’ friendship was founded on stories. Shibahara, deciding she’s “not very smart,” becomes the class clown. She’s never read a novel, until she befriends Kunitachi, a cooler girl who is always reading “books with no pictures.” There’s a classic manga miscommunication, but all’s well that ends well. I thought some of the art was really cute, like “Let’s Eat Ramen.” The weird style of “Urameshiya” grew on me, too. But “Plastic Blue” was so-so, and the style of “You Make Me Dizzy” didn’t do much for me at all. But keeping in mind that this is dojinshi, independently produced comics, it wasn’t too bad. There were a few wonky pages in “Plastic Blue,” but I think that will be fixed in the final print. When I was your age, these stories were impossible to find in English, and then when they became available, they were illegal scans. This is a step in the right direction, as is GEN Manga‘s completely reasonable pricing. I received a free digital copy of this book from NetGalley in exchange for my honest review. When I signed up for Story Cartel, I went straight for the fantasy and kidlit selections because, well, that’s what I read and that’s what I felt most comfortable reviewing. I chose Dragon’s Blood by Edward Branley because it had a nice cover. You know what they say, “never judge a book by it’s cover”? Well, they say it for a reason. Joey, Anne Marie, and David are three teens from New Orleans. They’re smart enough to understand this. Imagine their surprise when a “dragon’s egg” they bought online turns out to be from an ancient trading company that sells “collectibles and curiosities”. Suddenly it’s more than just kidding around, as they help their dragon avoid danger and evolve to its full potential! For over a thousand years, the dragons have used the merchant concern, Hassan’s Collectibles and Curiosities to help identify those worthy of becoming the “Blood Bound” — humans who are willing to hatch dragon eggs and nurture the hatchlings to adulthood. The methods used by Hassan’s have changed over time, but the results are the same. The dragons live! It’s never been easy to be a teen. Asking a teen to hatch a dragon egg is a big request. That’s why it’s important to choose a teen who has friends to help. Better yet, get three inseparable kids to do the job! The cover art, as I mentioned, is what drew me to the story. The premise reminds me of Jeremy Thatcher, Dragon Hatcher, a book I loved when I was a kid, but if Jeremy had internet access. I didn’t finish this. I’m not one of those people who powers through when books get boring. There are only so many hours in the day. I dropped this book partway through the first chapter. Why? I didn’t feel like anyone had taken the time to edit it. So why should I take the time to read? 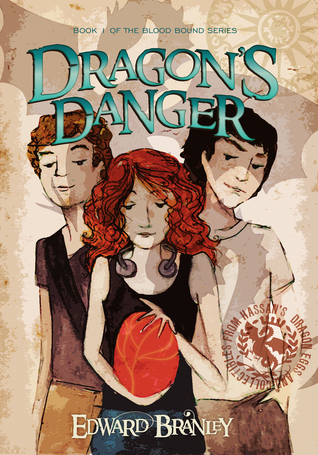 Dragon’s Danger is billed on StoryCartel as a “middle grade contemporary fantasy.” SFWA quotes agents and editors as defining MG as for children age 8-12. Dragon’s Danger has a casual F-bomb in the first chapter; searching the e-book pulls up an additional twenty five instances of the F word. His author bio rather defensively states, “he can attest that sixteen-year olds attending Catholic school do swear like the Trio do,” and while I’m sure they do, this is inappropriate language for a MG book. I wouldn’t feel comfortable putting this in my students’ hands. So why was this a MG book? The characters are rather old for a normal MG protagonist (they’re all sixteen or so) and the language was more suited to a YA audience. This was the real lack of editing that made me decide not to finish this book, more than some awkwardly worded sentences. I received a free digital copy of this book from StoryCartel. Seventeen-year-old Vivian Apple never believed in the evangelical Church of America, unlike her recently devout parents. But when Vivian returns home the night after the supposed “Rapture,” all that’s left of her parents are two holes in the roof. Suddenly, she doesn’t know who or what to believe. With her best friend Harp and a mysterious ally, Peter, Vivian embarks on a desperate cross-country roadtrip through a paranoid and panic-stricken America to find answers. 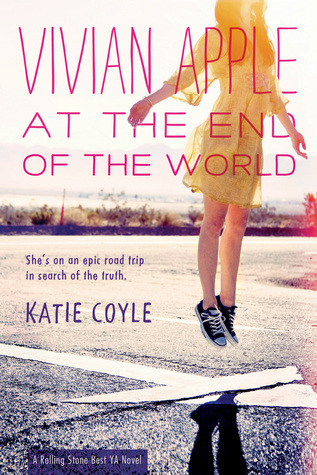 Because at the end of the world, Vivan Apple isn’t looking for a savior. She’s looking for the truth. I could not put this book down. It’s one of those things that I would sneak in pages at any opportunity – on the train, during lunch, under my desk, in the middle of a conversation. I needed to know what happened, and I needed to know if the Rapture happened or not. (I won’t say. Spoilers.) Some twists, I sooo called before they were revealed. Others, I didn’t guess. It was a good mix; it shouldn’t be too obvious, or too difficult. This wasn’t a mystery novel, although the mystery of the Rapture is the question Vivian has to answer, and why she goes on her Great American Road Trip out west. I’m not sure how I felt about the ending, and I think the sequel, Vivian Versus America, will help me decide whether or not I liked it. How things shake down from here will put the end of the first book in perspective. Vivian felt real to me, and I think a certain kind of goody two shoes will relate to her, although personally, I think reading this as a high schooler, she would have annoyed me. But Vivian was very “likable.” She’s the sort of person you’d want to befriend. It’s subtle, but there’s an undercurrent of feminism throughout the whole story. Vivian drives the plot, and most of the time, the car. The Rapture happens to her – and her parents disappear, leaving holes in the roof of their home – but after a little bit of wallowing, she takes action to get to the bottom of this mystery. It’s Vivian who decides to leave the New Orphans and Vivian who decided to take this road trip in the first place; Harp and Peter are just along for the ride. Along the way, she articulates her discomfort with the Believer’s anti-feminism, how women are controlled by Frickism, following “their” men a step or two behind, dressing “modestly,” punished for their sexualities. Frickian homophobia becomes a plot point, but that’s not something that happens to Vivian, but it happens to scare Vivian. Vivian is a straight white girl. Her best friend, secondary character Harpreet Janda, is Indian-American. Harp’s brother, Raj, is gay. So, points for inclusion, but this is still Vivian’s story and, given the unsubtle message about the dangers of religious fundamentalism and extremism, it would have been stronger if Vivian had been a person of color, or a queer, or disabled, or something that put her in danger from the remaining Believers. I would have found the story much more compelling if Vivian had more at stake – if Peter, the love interest, were Petra, for example. Even Vivian’s non-Belief isn’t a thoughtful articulation of her theological or even moral qualms with Christianity in general or Frickism in particular, she just floats along, not believing. How would this story go if she did believe, but in something else? What if Viv was Catholic? What if Viv was Muslim? I don’t want to hate on this book for everything it wasn’t, but I think it could have been stronger if Vivian had more left to lose after the Rapture. Once upon a time, I saw Laura Lam’s Pantomime on the shelf. Intrigued by the cover, I picked it up and read the jacket copy. I put it back down. R. H. Ragona’s Circus of Magic is the greatest circus of Ellada. Nestled among the glowing blue Penglass—remnants of a mysterious civilization long gone—are wonders beyond the wildest imagination. It’s a place where anything seems possible, where if you close your eyes you can believe that the magic and knowledge of the vanished Chimaera is still there. It’s a place where anyone can hide. Iphigenia Laurus, or Gene, the daughter of a noble family, is uncomfortable in corsets and crinoline, and prefers climbing trees to debutante balls. Micah Grey, a runaway living on the streets, joins the circus as an aerialist’s apprentice and soon becomes the circus’s rising star. But Gene and Micah have balancing acts of their own to perform, and a secret in their blood that could unlock the mysteries of Ellada. Okay. Yawn. Whatever. It sounds like a hetero romance, and that’s cool I guess but I don’t care. I’m also really tired of “not like other girls” girls. I was a tomboy growing up. I get it, the weird sense of alienation from your girl peers when they’re all wearing glittery tank tops and talking about make-up while you’re wearing a men’s tee shirt from the Smithsonian Air and Space Museum and talking about Pokémon. Believe me, I get it. … but did no one in the coresty eras like clothes and fashion? Or do those girls not deserve to be protagonists, only fashionable, simpering friends? So, yeah. I totally skipped this one. I went on with my life and read other things and forgot about Pantomime for awhile until I saw Shadowplay. 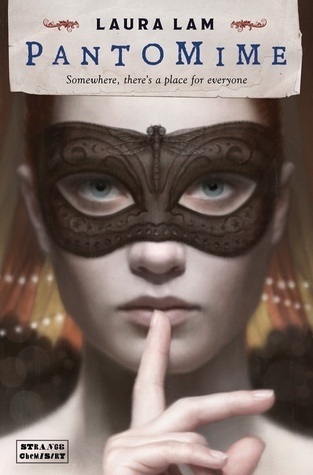 I liked that cover, too, and I didn’t connect it to Pantomime until I finished reading the blurb. The circus lies behind Micah Grey in dust and ashes. He and the white clown, Drystan, take refuge with the once-great magician, Jasper Maske. When Maske agrees to teach them his trade, his embittered rival challenges them to a duel which could decide all of their fates. A tale of phantom wings, a clockwork hand, and the delicate unfurling of new love, Shadowplay continues Micah Grey’s extraordinary journey. Now you’ve got me interested. *He was raised as a girl, but identifies as a boy. An intersex teen, Iphigenia Laurus, or Gene, raised as the daughter of a noble family, is uncomfortable in corsets and crinoline, and prefers climbing trees to debutante balls. Gene’s parents wish to force a decision on which gender Gene will spend the rest of Gene’s life as, so Gene runs away from home, assumes the identity of Micah Grey, a runaway living on the streets, joins the circus as an aerialist’s apprentice and soon becomes the circus’s rising star. I don’t want to be a queer book detective any more. Could you write a very interesting story, told in a series of alternating flashback/present day chapters and have it be a big reveal that they’re the same person? Yes. It would be a cool story, but it is not this story. It’s no surprise to discover that Gene and Micah are one and the same. It’s not a spoiler. There’s no reason not to put it out there. How many other readers aren’t finding this story because the jacket copy says it’s not for them? Do we have to “trick” cis/het readers into picking up queer books at the expense of queer readers? I didn’t grow up anywhere near Miles City, but it sounds an awful lot like Milton(, Vermont). The profanity never sounded gratuitous to my ears; that’s how rural kids talk. We didn’t have a cool old abandoned hospital, but we did have a broken down creamery where teenagers went to smoke weed and graffiti walls. I only went in there once, as a senior, in broad daylight. I was never one of the “cool” kids like Cameron, who grieve by acting out. Cameron is sent to Promise by her evangelical aunt, who raises her after her parents die suddenly in a terrible car accident. This is going to sound weird, but bear with me: I felt like the “dead parents” thing didn’t fit in with the story. It was the one thing that didn’t quite work for me, although Danforth’s writing rang painfully true when Cameron talks about how she never knew her parents as people, and how they became saints in her memory, untouchable because she felt so guilty, like they died because she was kissing a girl and shoplifting. My father passed away when I was fourteen, the summer before I started high school. Unlike Cameron’s parents, my family saw my father’s death coming. I guess I wanted her parents’ deaths to play into her character more – the only time it came up directly was when her counselor suggests that her parents’ parenting mistakes “made” her act out on “inappropriate gender identity” and “sexual sin.” At the same time, I knew how after a parent dies, it’s everything but also nothing. How do you write that? I don’t know. I wonder why Danforth decided to go with the dead parents route. After all, it’s not like parents never send their kids to “ex-gay/conversion therapy” – although it is now banned in many states, at least for minors. Either way, I couldn’t put it down. The first half or so seemed long, but maybe that was because of the sense of impending doom. Everyone knows Cameron gets sent to Promise, so every time she kissed a girl, I kept wondering, is this it? is this the time she gets caught? It’s a lot like But I’m a Cheerleader except a lot less campy and a lot more depressing. It takes place around the same time as the cult classic movie, beginning in 1989. It was the year I started elementary school, and if the world was a different place for LG and B youth, trans youth didn’t even “exist.” Don’t expect the novel to be painless if you grew up queer in the 90s. Having read the novel, I can attest to its impact, since I did grow up queer in the 90s. 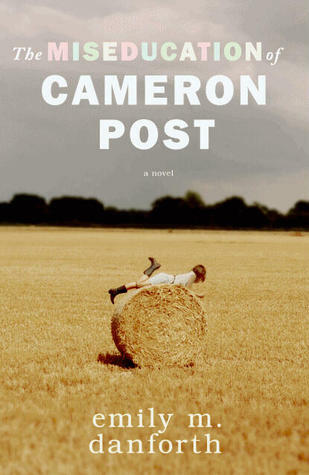 Maybe it was that, or Danforth’s beautiful writing, but I believed in Cameron in a way I haven’t believed in a story protagonist in a long time. Maybe it was the first person narration? I don’t know. I wrote before about how we lose some of that immersive reading we had as tweens when we get older, but I found it again in this book. It’s that good. The ending left me hungry for more, but in what I think of as “a His Dark Materials way.” I want to know what happens to Cameron throughout the rest of her life, immediately after up to wherever she’s writing from, but I don’t want to be told. I don’t think I want a sequel. (Of course, I would read one, if Danforth wrote it.) Some of Cameron’s reflective narration hints that she turns out okay, especially when she’s reflecting on the pseudoscientific nature of her “therapy” at Promise.